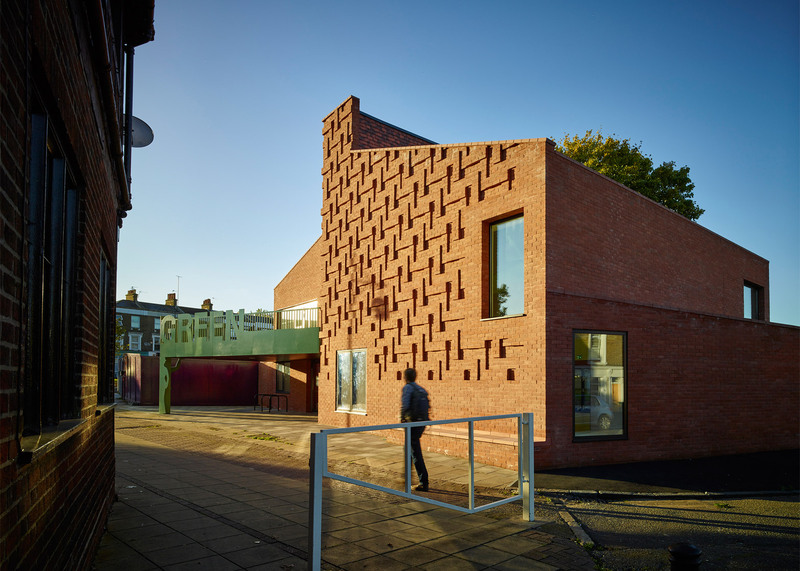 Architecture studio AOC gave this community centre in south London a textured, herringbone-patterned facade to reference a mock-Tudor pub across the street (+ slideshow). 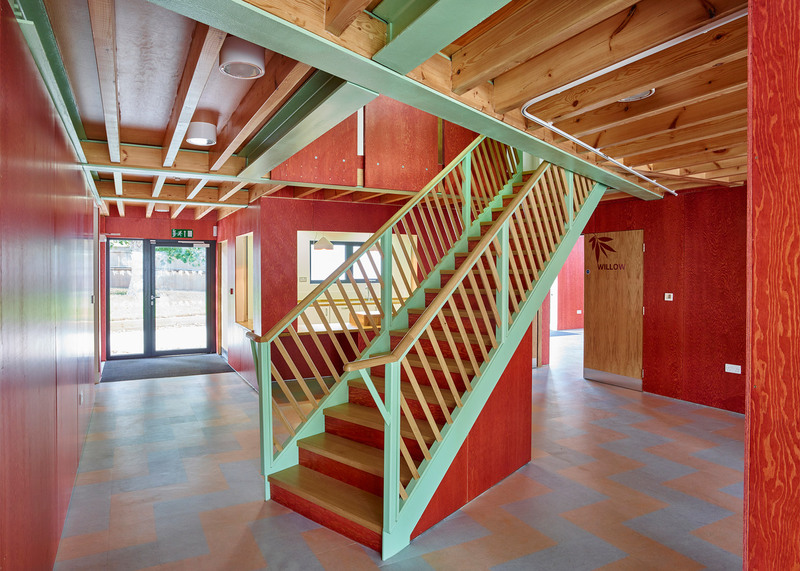 The 300-square-metre centre overlooks Nunhead Green in the London Borough of Southwark, and is the first building to be completed as part of AOC's masterplan for the area. The Green, named after the adjacent park, is designed to host a variety of community activates, ranging from new-wave taekwondo and football for under fives, to jumble sales, children's parties and wakes. 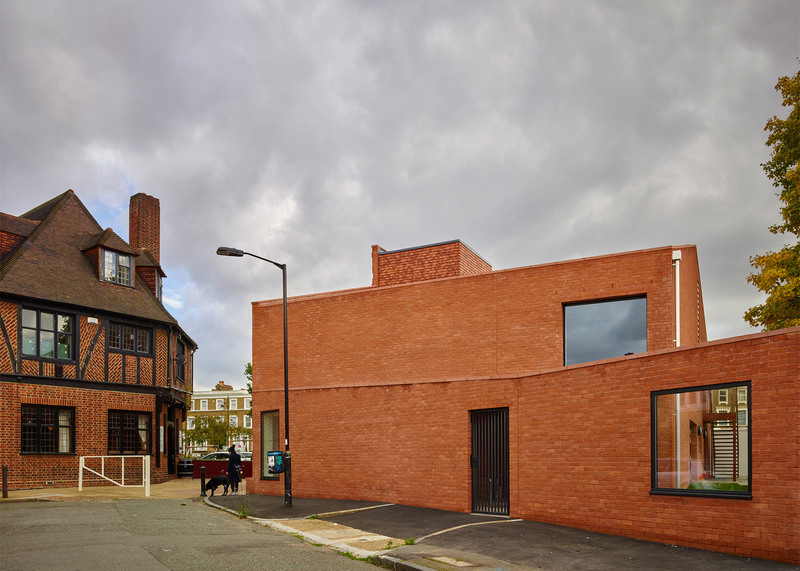 The building takes its cues from the area's existing architecture, borrowing its red brick construction from nearby Victorian terraced housing and its herringbone relief facade from the neighbouring pub. 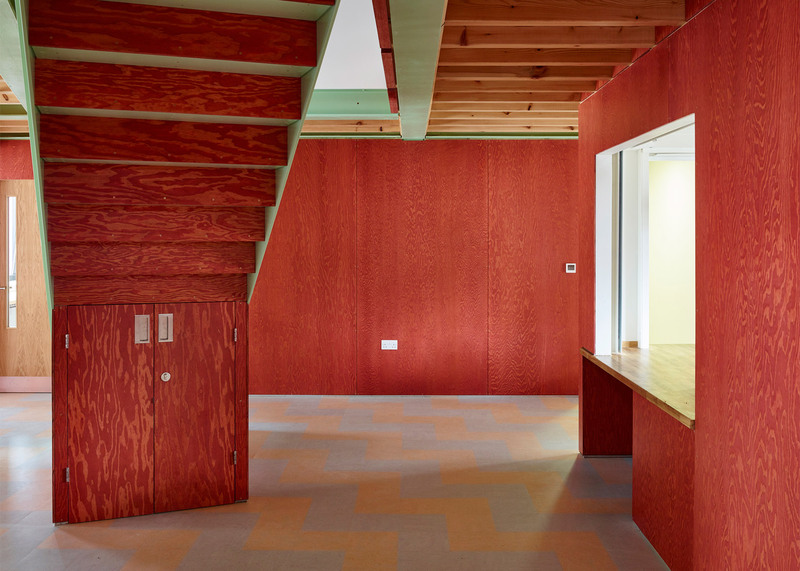 "The building samples the forms, materials and myths of Nunhead to create a modern building that is particular to the place and resonates with it's past," said the London-based practice. 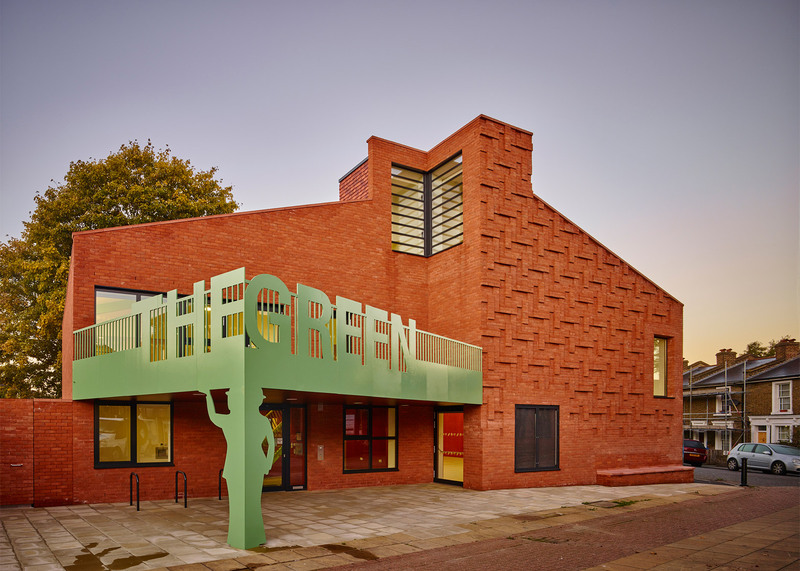 "The building takes the form of a large public house," it added, "a two storey, pitched-roof building that makes a positive contribution to the ad-hoc ensemble of masonry buildings that have evolved around the green over the last 200 years." Windows set into a chimney-like protrusion from the roof act as a lantern at night when illuminated from within. This feature is intended to reference the chimneys of the green's Victorian almshouses – a type of charitable housing that dates back to the 10th century. 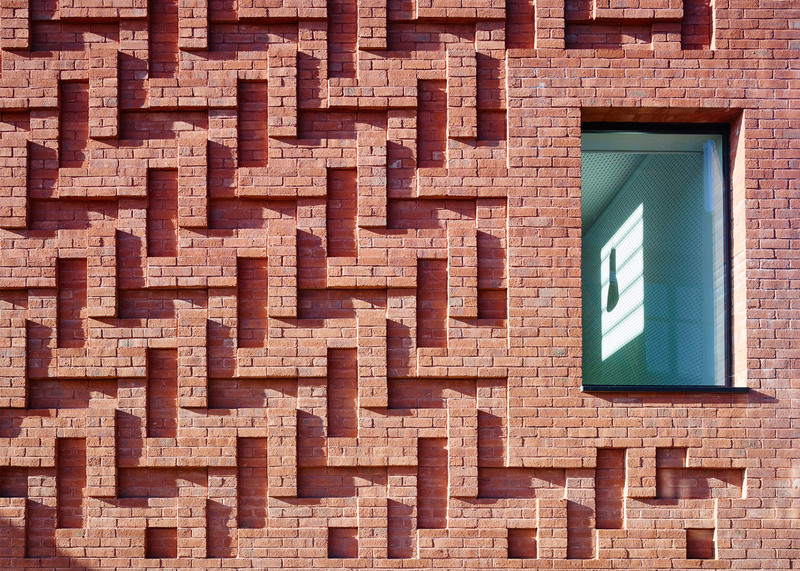 "The super-scaled herringbone relief brickwork that animates the main elevation is an enlarged version of the neighbouring Tudorbethan pub's brickwork, giving a civic monumentality to a modest scaled building," said the studio. "The homogeneity of the brick and matching mortar ensures the little building has a large mass, giving it a strong presence amongst its larger neighbours," it added. The building is set back from the site boundary to form a pedestrianised area around the west end of the green, which the architects hope will encourage gatherings to spill out onto the adjacent park. 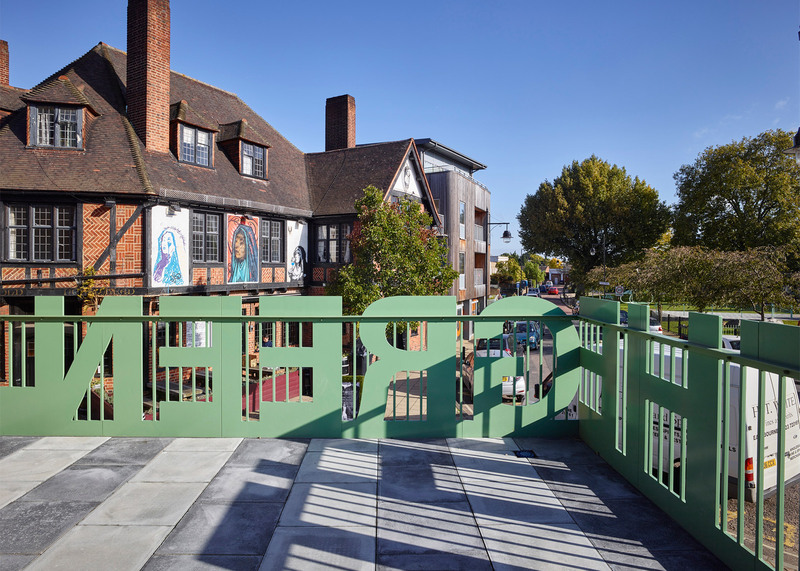 A balcony extends over the street-facing entrance and is painted bright green to match other street furniture in the redevelopment area. Signage built into the upper balustrade provides a billboard for the community centre, while a steel cut-out of Jenny Hill supports one corner. 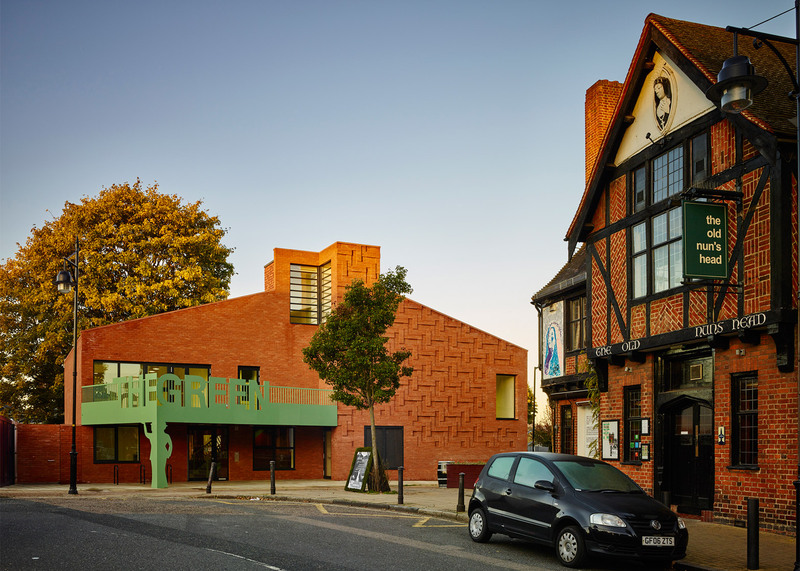 The Victorian music hall performer is buried in nearby Nunhead cemetery, and the architects felt her stage name – The Vital Spark – resonated with the project's goal of being a catalyst for the neighbourhood's regeneration. This front facade also features a built-in bench, noticeboard window and glass doors that offer glimpses through the building to the garden beyond. 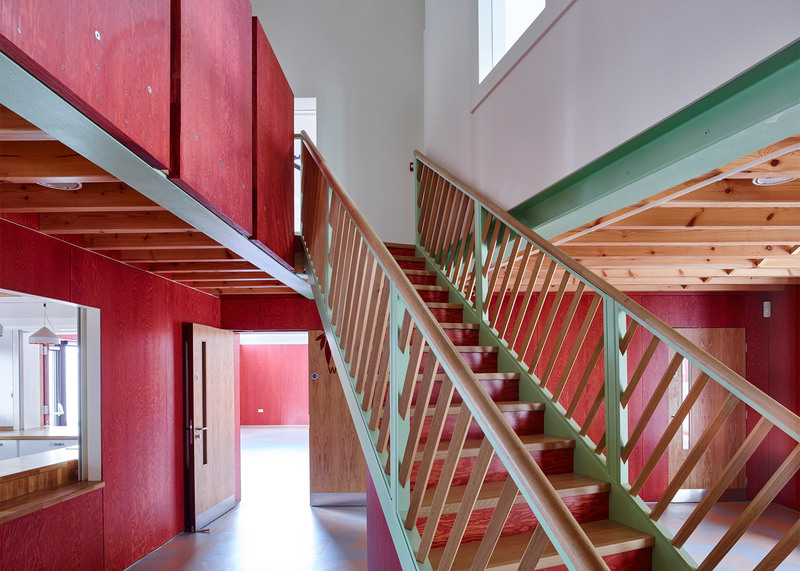 Inside, red- and green-lacquered glulam beams and Douglas fir define a series of rooms arranged around a double-height atrium and staircase. This central space is intended to provide a multi-purpose space – a cafe, foyer or performance space – which links to the kitchen at the rear. "Exposed timber joists animate the ceiling and the walls are red-stained Douglas fir ply, the rich grain providing an economic lining with a luxurious character," said the studio. The community centre replaces two 1970s council buildings, which were forced to close due to high running costs. The architects put in place a series of energy efficiency measures to ensure its economic viability. The project was awarded a BREEAM sustainability rating of excellent – in part due to its highly insulated walls, which keep heating costs low. The centre is run by Nunhead Voice, a charitable body formed by a group of local residents and volunteers.